Shelley, aka Shelly Magoo, is a beautiful, 2-year-old fawn female born June 5, 2007. 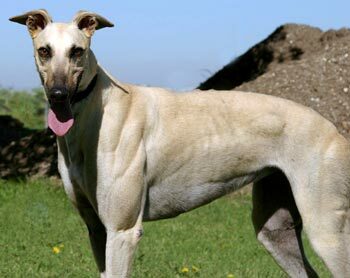 Her sire is Fuzzy’s Warbird, and her dam is GALT’s own Cleo, aka I Bex Cleopatra, making Megan and Shelley siblings! Shelley’s 4-race career took place within a 2-week period at Valley Rack Park in Harlingen, TX, in March and April 2009! Shelley, like Megan, figured out early on that the racing life was not for her! So here she is, looking for her forever home and family! It is not know at this time if Shelley is small animal or cat tolerant. 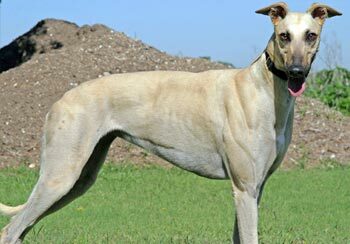 Shelley is a beautiful, petite, light fawn - blonde, actually - 2-year-old, with a dark muzzle and deep brown eyes that look like someone got carried away with the kohl eyeliner. Although she was shy and tentative at first, her personality is blossoming into a sweet, bouncy girl who gets along with everyone, doesn't like being left behind, and loves to collect. Shelley is a calm 2-year-old. She likes to play and go for walks, but she appears to have pretty well outgrown puppyhood. Although somewhat hand-shy at first, if she is offered a hand from a side position, she allows petting and quickly develops the confidence to approach for petting, while giving little air kisses. She is definitely not a loner and wants to be where her family is. For a beginner, she walks reasonably well on leash and, although she alerts to rabbits and squirrels, she doesn’t bolt after them or turn into a whirling dervish. Shelley gets along well with all the dogs in the pack. In fact, she will probably do best in a home that has other dogs or someone who is home a lot. She seems to draw confidence from being with other dogs and learning from their behaviors. She has had few accidents in the house, always due to human inattentiveness, but hasn't picked up on the usefulness of the doggie door unless it is held open for her. She doesn’t mind being in the crate but will let you know when she thinks she has been in there long enough. A collector, everything you have left within reach will be found on her blanket or somewhere in between, in fine shape, just not where it was. She does seem to enjoy shredding paper, so the Sunday TV guide should probably be put away. She does love the squeaky toys, especially the one that looks like a jack. Although she doesn't counter surf, she will help other dogs finish their meals if they aren’t as speedy as she is. But Shelley learns quickly and a calm, quiet reprimand is all she needs. 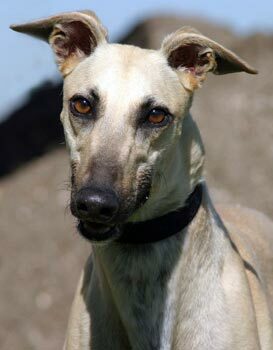 Sweet Shelley will slip quietly into your family without making waves and it will seem that she has always been there.